Summary: What is the optimal allocation of your online advertising budget? 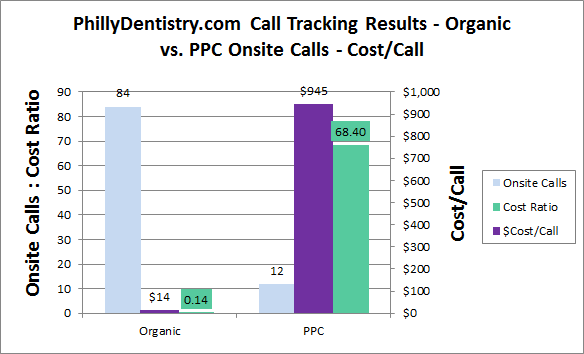 We compare the cost per lead of organic versus PPC advertising for a dental website. The ultimate product of online marketing efforts are leads. Traffic and rankings are nice, but calls and emails are what drive more customers from websites. This article shows how call tracking can help optimize your marketing budget to maximize leads and minimize overall cost. The tracking software records data about the phone calls, which can include source, location, duration, and even record the calls. By attributing the source of phone calls to different channels, site owners can see which channels are the most cost effective at driving phone calls and allocate their resources accordingly. That's it! Now once a user accesses your site, the phone number will change depending on the source (say Google natural, Google PPC, and direct). Dr. Ken Cirka of PhillyDentistry.com kindly volunteered to use let us use his results for this case study. 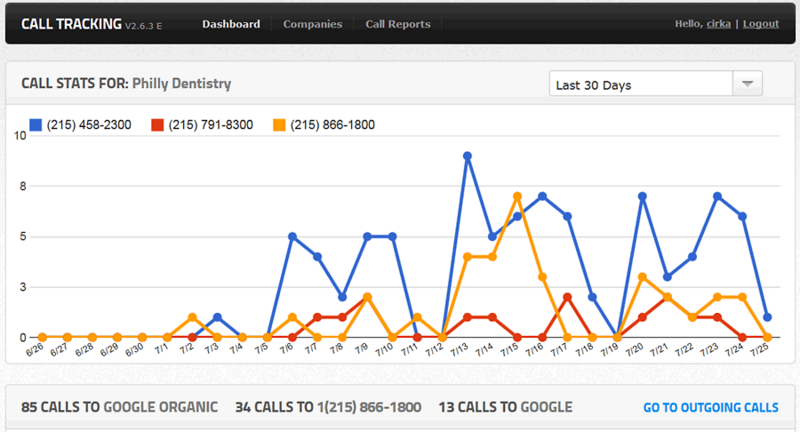 After less than a month of tracking phone calls, the results for PhillyDentistry.com are shown in Figure 1. 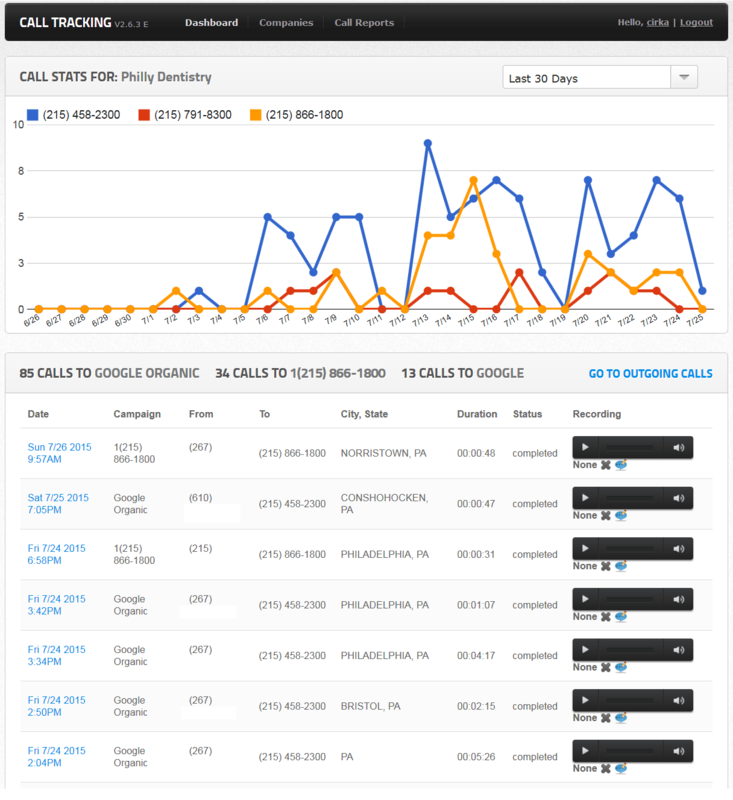 The blue (2300) line are Google Natural calls, the orange (1800) line are direct calls (bookmarked, link, direct), and the red (8300) line are Google PPC calls. You can see the organic calls dominate the paid calls (more on this later). To capture all the calls from Dr. Cirka's online marketing campaigns we enabled call extensions and forwarding numbers on Google Adwords. These "off-site" calls come from people manually calling the phone number from the ad, or clicking on the ad's phone number on a mobile device. 81 calls were generated from PPC ads on Google, 73 of which were from smartphones, and 8 from desktop computers. During the same time period, we used Google Analytics to track email leads generated by the PhillyDentistry.com website. A total of 102 emails were generated from the website during the time period in question. 69 of which were from organic traffic, 14 from paid traffic, and 19 emails were from direct traffic. Note that 68 emails were from mobile devices. Note also that the conversion rate of organic traffic was 4.38 times greater than PPC traffic (5.44% vs. 1.24%). Putting it all together let's calculate the cost per lead and cost per call. 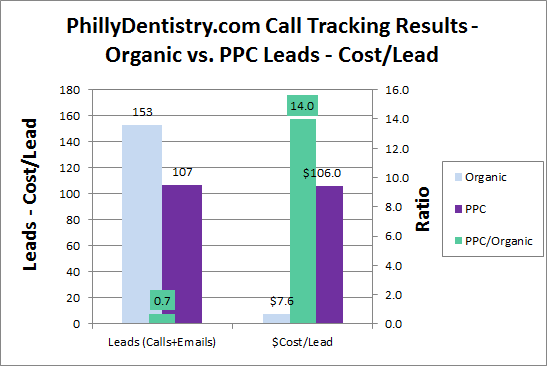 Figure 3 shows the cost per lead (calls + emails) for both organic and PPC advertising. Each organic lead costs $7.60 and each PPC lead costs $106, some 14 times more than natural. The leads section shows that even though Dr. Cirka is spending 9.8 times more on PPC than natural, he is getting only 70% of the leads that natural generates (107 leads for PPC vs. 153 leads for natural). We attribute the better performance of natural PR to PPC to the higher conversion rate of natural versus PPC (4.4X more likely to email, and 6.2X more likely to call onsite), the higher preference for selecting natural results on search engines (70-85% click on natural results vs. PPC), and the trend we've seen of increasing PPC cost per click versus the decreasing cost of natural SEO leads over time as backlinks accumulate. 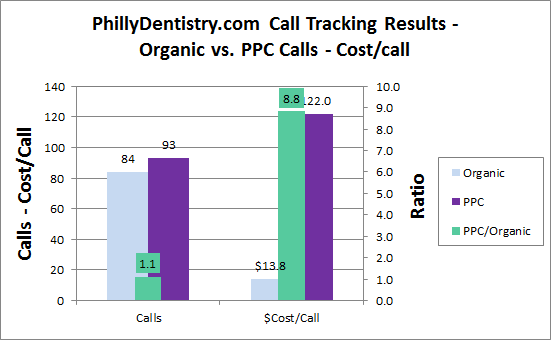 Figure 4 shows the cost per call for PhillyDentistry.com. The cost for a PPC call (both on and off-site) is $122 per call, while the cost per call for natural is $13.8, some 8.8 times less than PPC. Looking at only the calls generated from the website the difference is nearly 8 times larger. The cost of an onsite PPC call is $945, while the cost of an SEO call is only $14, a ratio of 68.4 to 1. 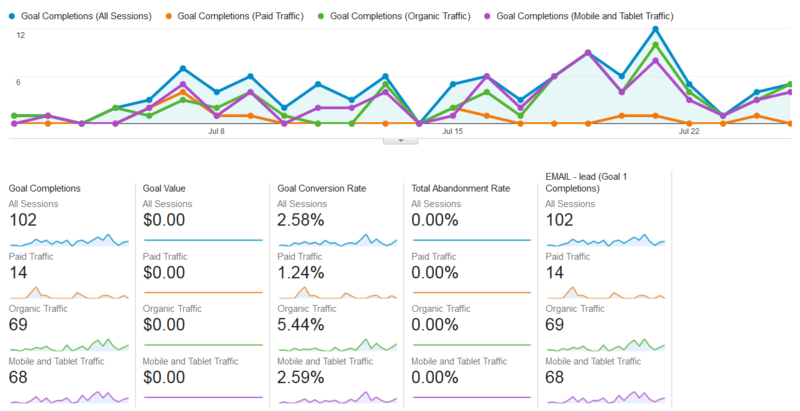 65.2% of the visitors to phillydentistry.com were on a mobile device, and 66% of the email leads were from mobile. For PPC advertising, 90.1% of the calls were from smartphones, and 9.9% were from desktop computers. Organic visitors are more engaged: - they stay 2.4 times as long, email 4.4 times more often, and view 1.5X more pages than PPC visitors. Organic visitors also go deeper into the site than PPC visitors. Categorize smile gallery, blog, and testimonials to give more service-specific pages to index. Based on this lead tracking data, it is clear that organic advertising is more efficient than PPC advertising at generating leads. In fact, in this case a PPC lead cost about 14 times more than a natural lead. Dr. Cirka could actually spend less money and get more leads by shifting some of his PPC budget to natural, and shifting his remaining PPC budget to mobile ads. Found that the cost per natural visitor decreased over time as backlinks accumulate. Also found that PPC leads cost on average 3 to 5 times more than natural leads, and PPC cost per lead tends to increase over time as more businesses join adwords and bid up the price. Offers phone call tracking, recording, and analytics. Call tracking software from Mongoose Metrics to optimize your desktop and mobile spend. The subject of this article. Dr. Ken Cirka tracks phone calls on this site to optimize his advertising spend. Last modified: September 28, 2015.